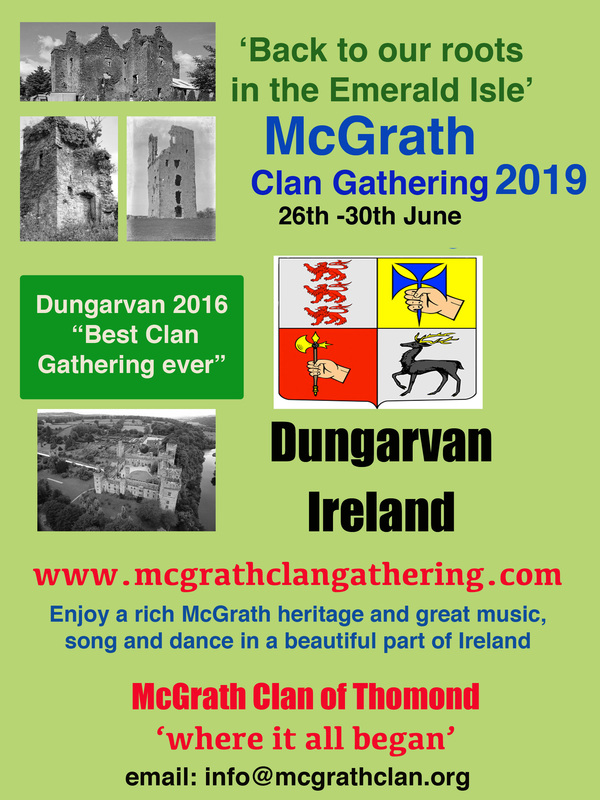 The next official McGrath Clan Gathering will be held in Dungarvan, Co Waterford, Ireland, in June 2016. It will run from Thursday 23rd to Sunday 26th in the beautiful coastal town on Ireland’s south coast. There will be Talks, Day Trips, Clan Dinner and some great Irish Traditional Music, in an area rich in McGrath heritage and famed for it’s quality of trad music. Visitors will have the option of taking a 5 day/4 night tour immediately after the Clan Gathering to other areas associated with the history of the McGrath Clan. Drop an email to danmcgrathmedia@gmail.com to be put on the mailing list for the event. This entry was posted in Uncategorized on April 4, 2015 by McGrath Clan (official).